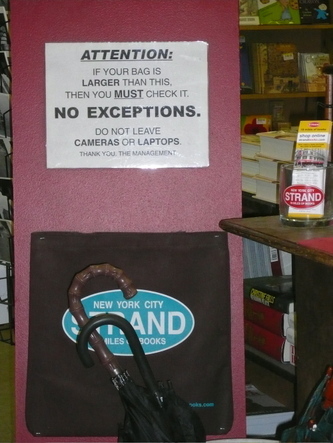 Leaving aside the obvious contradiction of strategy (laptop users are more likely to buy books and less likely to steal stuff, so why not let them in the store and offer them a mesh bag to carry about), this sign highlights one of the silliest (and common) policy rules: no exceptions. If I gave you a million dollars could you make an exception? And on top of the unreality of the idea, consider the message it sends to the consumer. "We're so busy and so centralized and so hierarchical that you shouldn't even bother to discuss this with our staff." Or, the short version, "go away." To keep costs down, we require anyone carrying a bag bigger than this square to check it. Our check area is run by Ralph, who is kind and honest, but I hope you can understand that we can't be responsible for any items you might want to check. If this is a problem for you, consider asking for one of our mesh bags, which can safely tote your laptop or camera. Thanks for shopping at the Strand... we're really glad you're here. If making a sign gets you all stressed out, let someone else do it for you. On a related note, another thing that's been irking me is when a sign begins 'Polite notice'. Just put up the notice and allow me to decide if it's polite, please. It's a rough rule of thumb that if something begins 'Polite notice' that what follows is not polite. THEN YOU MUST CHECK IT IN. Presumably the sign is in response to a high level of shop lifting, but even then I can’t believe that more than 5% of their customers are thieves, in fact the statistics I found for the UK show that shrinkage from small retailers is on average 1.91% and large retailers 1.49%. So why treat the 98+% of customers that are honest like thieves? To keep costs down, we require anyone carrying a bag bigger than this square to check it. Our check area is run by Ralph, who is kind and honest, but I hope you can understand that we can’t be responsible for any items you might want to check. If this is a problem for you, consider asking for one of our mesh bags, which can safely tote your laptop or camera. Thanks for shopping with us… we’re really glad you’re here. Which do you think would make your customers feel more welcome? Older PostNew England Shirt with dwarfed Rose?